Here are our latest work from home jobs and ways to earn extra cash, hand-picked from across the Internet. We post new leads every day except Sunday and holidays, so be sure to bookmark this page and check back daily. Another Extra-Cash Option – Postmates – Earn extra money delivering for Postmates. No commitments, take home 100% of what you earn. Work from Home Concierges Needed – Aspire Lifestyles: Hiring from GA, FL, TX and AZ. If you’d like a Concierge position with benefits and paid online training, Aspire Lifestyles is hiring. Starting pay is $15.50/hr. “Earn up to $45,000 annually” depending on performance and hours worked. Full-time or part-time not mentioned, but the jobs come with benefits, so they may be full-time. You’d be handling concierge calls from premium American Express card members. Be Alerted as Soon as New Jobs & Gigs Post – In response to the many requests we’ve received (sorry it took a while! ), we’ve just added a “push notifications” option to the site. It’s the little pop-up asking if you’d like to allow notifications from the site. If you click on “Allow,” you’ll receive little on-screen notifications when we post new jobs, or find a “hot job” that’s going to fill fast, or have other news that we think will help you in your job search and in de-rat-racing your life. Opt out any time if you don’t find them helpful. Make Up to $500+/Week Answering Questions at Course Hero — Nationwide. No degree required. If you’re looking for a flexible non-phone side gig, Course Hero might be a fit. Their active Tutors earn about $300 per week, the company says. “Top Tutors average $500 per week.” Work when you want. Work from Home Jobs at the United Nations – If you like the international picture, the UN always has work from home jobs open. Most are for consultants, specialists and similar roles. If you like to travel, some offer that option, too. Work from Home Test & Essay Scorers – Measurement, Inc.: If you’re looking for a seasonal side gig, Measurement, Inc., a testing company founded in 1980, is taking applications for part-time people to score student tests and essays online. Pay starts at $11.70/hr., with raises for experience and performance. Paid online training provided at the beginning of each project. Hiring from 37 states. Get Paid to Lose Weight — It’s harder to lose weight without a strong incentive. How about money? Bet on goals at HealthyWage. Then lose the weight and get paid. “The average prize for goal achievers is $1,331.” Could be a good reason to reach the weight you want! Work from Home Jobs With Amazon – Over 450 Positions Available Worldwide – Amazon has a page devoted to its work from home jobs. At the moment there are over 450 jobs classified as “work from home.” The types of work and the locations and salaries vary greatly… Minimum pay $15/hr. Work from Home F/T Customer Service Reps – Conduent: The giant spin-off from Xerox is hiring. No college needed, paid virtual training provided at $12/hr. Increase to $13/hr. after 90 days. Hiring from 37 states. Includes benefits. Another Extra-Cash Option – Charlie – Charlie is a free “personal financial assistant” like Trim. It saves users $80/week on average, the company says. Nothing to download, it works via chat. It tells you where you’re overspending, can negotiate your phone bill down (with your permission), identify subscriptions you’re not using, help you set up and stick to a budget, etc. Earn Up to $22/Hr. Teaching English Online – If you’re looking for a side gig with good hourly rates, these companies are actively hiring. Both involve teaching English to Chinese children online. Set your own hours, materials provided: Education First — $12-$19/hr. VIPKID — $14-$22/hr. For an advantage, schedule your video interview (and nail it) promptly after you apply. The video interview with each company is key. Don’t Miss Our Pet Photo Contest! Deadline April 21! $300 in Cash Prizes + 5 Free Admissions to Our Popular Job-Finding Course (a $245 value) — If you’ve got a “pet” (aka devoted and maybe spoiled sidekick, like ours here at RRR), send in a pic for the contest! Pics with the most votes win $100 (1st place) and $50 each for 2nd, 3rd, 4th and 5th places. 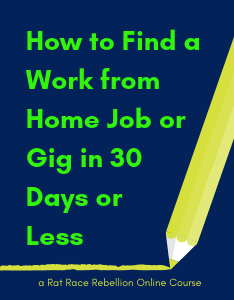 We’re also giving away 5 free admissions to our popular course, “How to Find a Work from Home Job or Gig in 30 Days or Less.” Click here for the contest! P/T “Mods” Needed -ModSquad: Hiring nationwide. The company provides help to clients for forum moderation, customer service, social moderation and the like. May involve chat support, ticket escalation or phone support. Not a fit for everyone — pay is on the low side — Glassdoor reports $9/hr. But it can provide work from home experience, update the resume, get cashflow going, etc. Work from Home Entry-Level Customer Service Specialists – Unum: Hiring from the Pacific and Mountain Time Zones. Equipment and internet provided. Benefits. If you’d like to work from home for a larger, established company, the insurance giant Unum is looking for more f/t Customer Service Specialists who live in the Pacific or Mountain time zone. Employee reviews on Glassdoor say pay is around $32,000/yr. P/T Work at Home Camping Reservations Agents – Aspira: Equipment provided. Hiring from FL, GA, ID, IN, KY, MD, MS, NY, OH, OR, PA, TX and UT. You’d be helping customers with camping, tours & activity reservations, as well as hunting & fishing licensing needs across North America. Pay based on your state’s minimum wage. Don’t Forget Our New Pet Photo Contest! Deadline April 21! $300 in Cash Prizes + 5 Free Admissions to Our Popular Job-Finding Course (a $245 value) — If you’ve got a “pet” (aka devoted and maybe spoiled sidekick, like ours here at RRR), send in a pic for the contest! Pics with the most votes win $100 (1st place) and $50 each for 2nd, 3rd, 4th and 5th places. We’re also giving away 5 free admissions to our popular course, “How to Find a Work from Home Job or Gig in 30 Days or Less.” Click here for the contest! 86 Non-Phone Jobs & Side Gigs — If you’re looking for a non-phone job, these screened options are open now. Most are available nationwide and don’t require college. Announcing our New Pet Photo Contest! $300 in Cash Prizes + 5 Free Admissions to Our Popular Job-Finding Course (a $245 value) — If you’ve got a “pet” (aka devoted and maybe spoiled sidekick, like ours here at RRR), send in a pic for the contest! Pics with the most votes win $100 (1st place) and $50 each for 2nd, 3rd, 4th and 5th places. We’re also giving away 5 free admissions to our popular course, “How to Find a Work from Home Job or Gig in 30 Days or Less.” Click here for the contest! Virtual Assistants – Move Forward Virtual Assistants: Hiring from PA only. The company contacted us recently. They’re looking for VAs with a HS diploma and experience in the medical and/or mental health field. Minimum two years’ experience in an administrative role… Part-time, pays $13/hr. PC or Mac OK.
86 Non-Phone Jobs Open Now – Not all work from home jobs and gigs are phone-based. Here are 86 legitimate non-phone options open now. P/T Jobs with Hallmark – Hiring Retail & Installation Merchandisers – If you’re looking for a part-time job, Hallmark continues to recruit Merchandisers. With these positions you’ll probably do your paperwork and reporting at home, and travel to local stores to perform the necessary duties. Many people appreciate the balance and flexibility of being able to get “out of the house” for a little while and be around other adults, without having to go “all in” with a traditional [email protected] job. Per employee reviews on Glassdoor, pay ranges from $8 to $15/hr., with an average of $10. 65 [email protected] Search Terms to Help You Find Your Job or Side Gig – We get many requests for our Big List of Work from Home Job Search Terms, from the toolbox we use here at RRR. (This is just a tidbit of what you’ll find in our new course, How to Find a Work from Home Job or Side Gig in 30 Days or Less. If you haven’t checked it out yet, have a look!) Phrasing is important. For example, while “work at home” is a common hook for scammers, “this is a work at home position” is more natural to the text used in legitimate work ads. Bottom line, there are fewer legitimate home-based jobs than there are scams, and using the right search terms is a great way to separate the wheat from the chaff. Get Paid to Lose Weight — It’s harder to lose weight without a strong reason. How about money? Bet on goals at HealthyWage. Then lose the weight and get paid. “The average prize for goal achievers is $1,331.” Sounds like a good reason to reach the weight you want! No Experience Necessary – P/T Transcribing Audio Recordings – Rev: For a side gig, Rev continues to recruit part-time Tanscriptionists, no experience required, no college needed. Set your own schedule. Many Rat Race Rebels are making extra cash there. (Sorry, but they say they don’t hire from CA or MA.) The company generally lets you know within 48 hours if you’re approved to start working as a freelancer. You won’t get rich, but you can get cashflow going and get work from home experience, and update your resume. Rev says its top monthly earning is $1,495, and the average is $245. Work from Home P/T Transcribing Audio Recordings – No Exp. Necessary – For a side gig, Rev continues to recruit part-time Tanscriptionists, no experience required, no college needed. Set your own schedule. Many Rat Race Rebels are making extra cash there. (Sorry, but they say they don’t hire from CA or MA.) The company generally lets you know within 48 hours if you’re approved to start working as a freelancer. You won’t get rich, but you can get cashflow going and get work from home experience, and update your resume. Rev says its top monthly earning is $1,495, and the average is $245. Work from Home Customer Service Representatives – Concentrix Hiring – Concentrix, a legitimate company and longtime hirer of home-based workers, continues to recruit full-time and part-time Customer Support Representatives. Per Glassdoor reviews, average base pay is $12/hr., but that’s not official. Many RRRebels have been hired by Concentrix. For the current jobs, they’re hiring nationwide except for the following: Alaska, California, Connecticut, Delaware, DC, Hawaii, Massachusetts, Maryland, Missouri, Montana, Nebraska, New Hampshire, New Jersey, New York, Oregon, Vermont, Washington and Wisconsin. Share the love! If you know someone looking for a work at home job or extra cash, please share this page. Thanks! PS – RRR uses screened affiliate links on this page to buy cheese crumbs for the rebellious rats here (that would be us).